What is biltong? 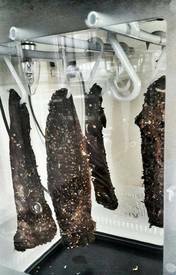 Proper biltong is simply cured dehydrated meat. Humans have been drying meat for centuries, it's not a new concept nor is it unique to South Africa. Having said that, biltong itself is South African in that it uses certain spices and certain techniques. Unlike the stuff they eat in America called beef jerky, biltong requires certain herbs and spices and a certain process to get it to taste the way it does.